Breakfast, at the Garden Grill brings family-style, all-you-care-to-enjoy, character dining to mornings in the Land Pavilion. The ever rotating restaurant will whisk you by a rainforest, farmhouse, thunderstorm, sandstorm and prairie scenes from the Living with the Land boat attraction. The menu for this new offering is basically an American-standard breakfast served family-style. The chefs at the Garden Grill have always made a point to use some element of food that has been grown and cultivated in the Living with the Land attraction. 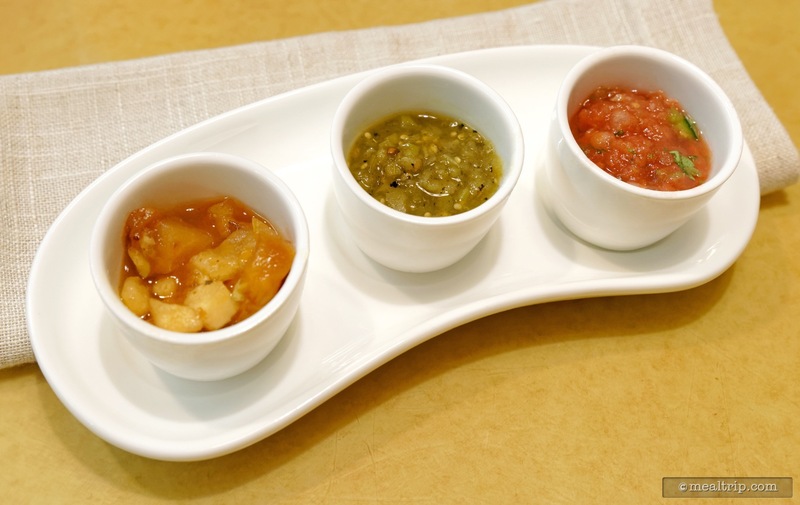 At breakfast, this seems to come in the form of a few salsas and chutneys that are brought to the table to act as breakfast condiments. 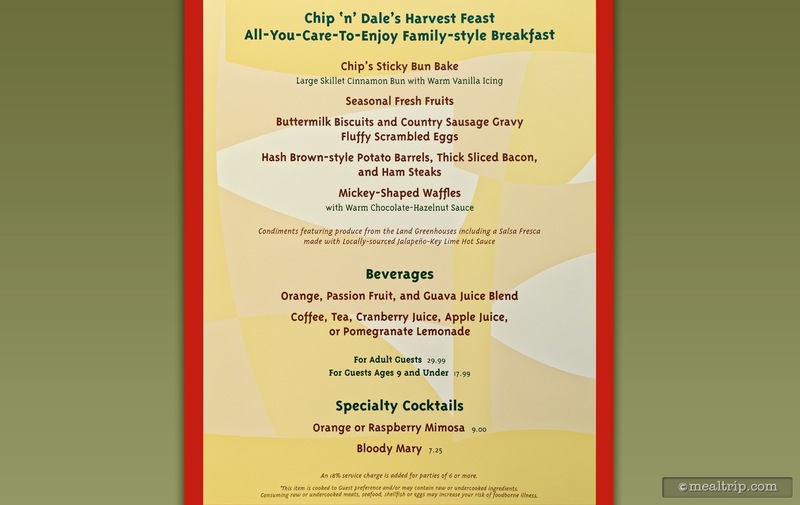 Some of the items may change seasonally, (but probably not by very much… the core American-standard breakfast formula menu is about the same at most Disney breakfast locations). 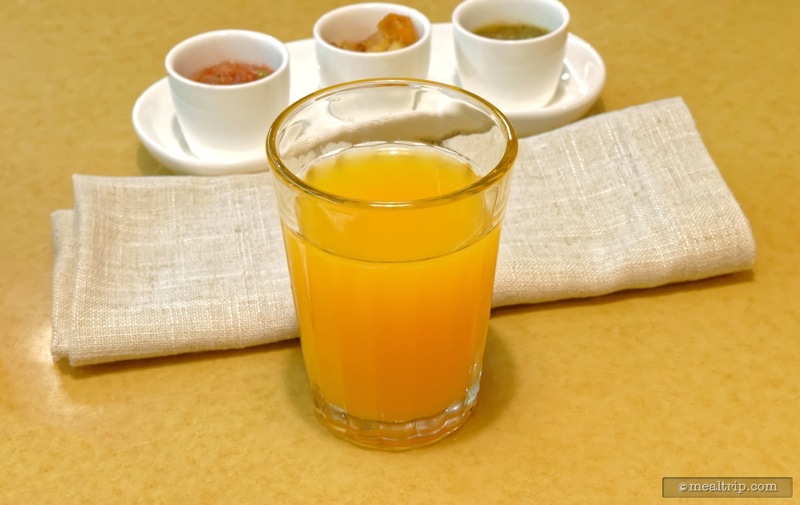 There is an orange, passion fruit and guava juice blend that acts as a "signature beverage" (the standard coffee, tea, soda, juice and water are also available). A giant "Chip's Sticky Bun Bake" skillet is show stopper here. 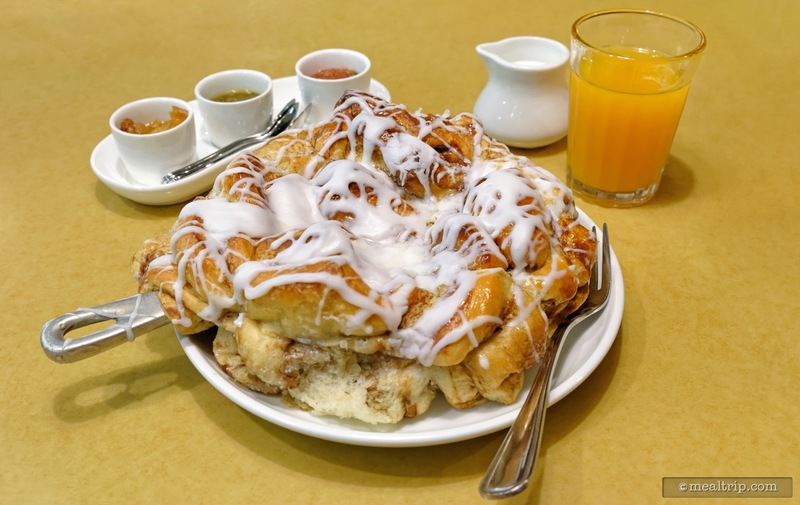 It's a giant cinnamon bun served warm with vanilla icing. 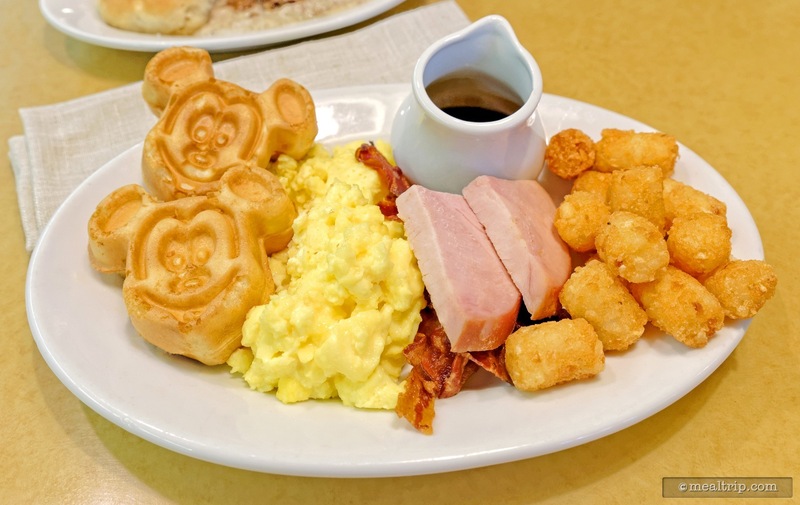 A fresh fruit bowl, scrambled eggs, biscuits and sausage gravy, potato barrels, bacon, ham, and Mickey-shaped waffles with chocolate sauce round out the offerings. Family-style means you can request more helpings of any (or all) of the items, for the duration of your breakfast. Pricing seems to hover at the high end of our scale at $34-ish per adult, but may be higher during peak visitor periods (i.e. the holidays). 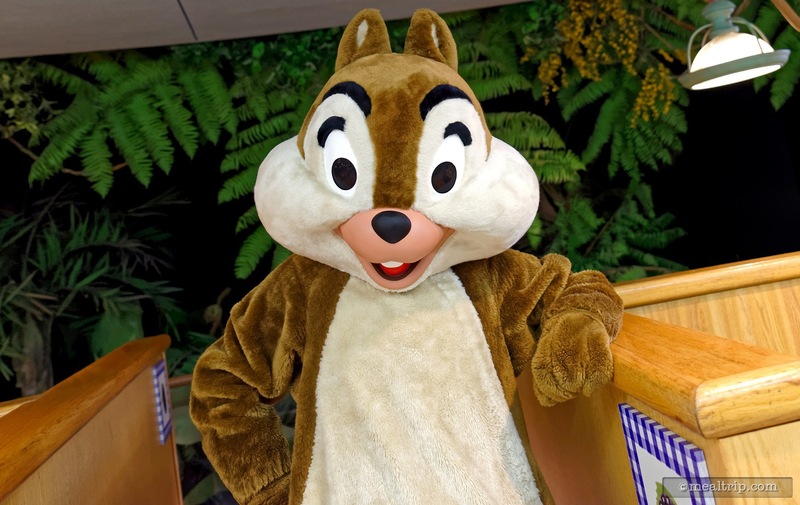 Characters at Garden Grill Breakfast usually include Chip and Dale, along with Pluto and Mickey… with Mickey being clad in his finest farm outfit. There is ample time to spend with the characters as they make their way around the restaurant as this is one of the locations that seems to offer a more private experience. You can only see a few tables in each direction at any given time so the noise levels are fairly minimal (for a character breakfast). The Garden Grill Restaurant in Epcot's "The Land" Pavilion has started serving up breakfast again, after a very long multi-year hiatus. 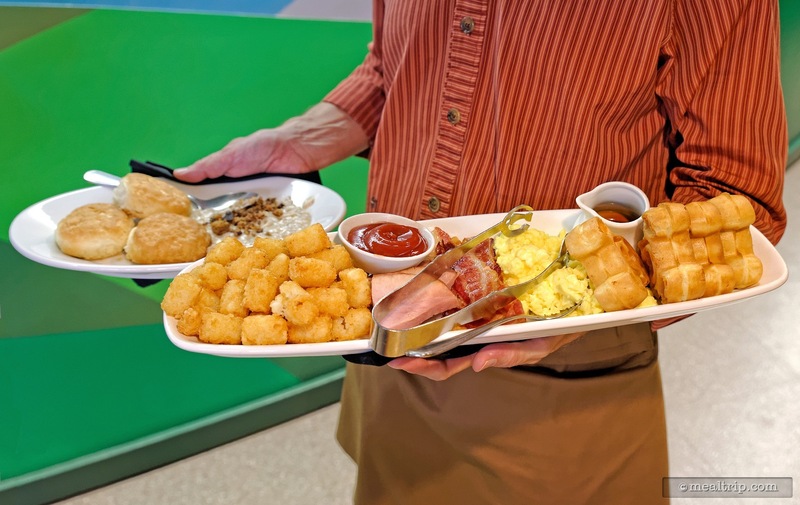 The breakfast period is a character meal and served family style (all you care to eat, but delivered to your table on a large "sharing" platter). The lunch and dinner periods are the same format. The circular nature of the restaurant provides a slightly private dining experience with Mickey, Pluto, Chip, and Dale as they make their way around from table to table. Because you can only see a few tables in either direction, the noise levels are about as low as they're going to get for a character meal. There's no grand photo-op at the beginning of the meal, so you will have to be ready to snap a photo as the characters make their way from table to table. It's worth noting that the dining area is split with a lower section and a second, higher seating area. Only "U" shaped booth seating is available on the lower area. These seats provide a great view of the various scenes (rainforest, farmhouse, prairie, etc.) from the Living with the Land boat attraction, via large glass "windows" that allow guests to view what the guests on the ride are seeing… from a much higher perspective. The upper-level seats really don't get much of a view (unless you stand up every once in a while to look over the partition that separates the upper and lower sections), but the elevated seating area is not without it's charms. The upper "all-chair" and table section allows groups quicker access to get up and pose with Mickey and his pals when they pay a visit table-side. 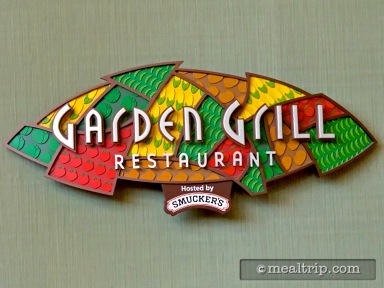 The breakfast at Garden Grill is probably best described as "American Standard" and is very similar to what you will find in most other character breakfast locations throughout the Disney parks and resorts. There is a juice blend (orange, passion fruit, and guava) available which is worth giving a try. The blend is very well controlled and doesn't seem to be too sweet or too acidic in nature. The adult in me would love to add equal parts Champagne and a teaspoon of Grand Marnier to the mix, but alas… those ingredients are not readily available at the Garden Grill. There are two mimosa's on the menu, but I should point out, this is a character breakfast, and not a resort cabana… so getting a "proper" quality mimosa, may be a stretch. That's just my two-cents... and a clever way for me to point out that the mimosas are extra, and not included with the "normal" price of breakfast. The first of two courses is (usually) delivered with the drinks and consists of two items. 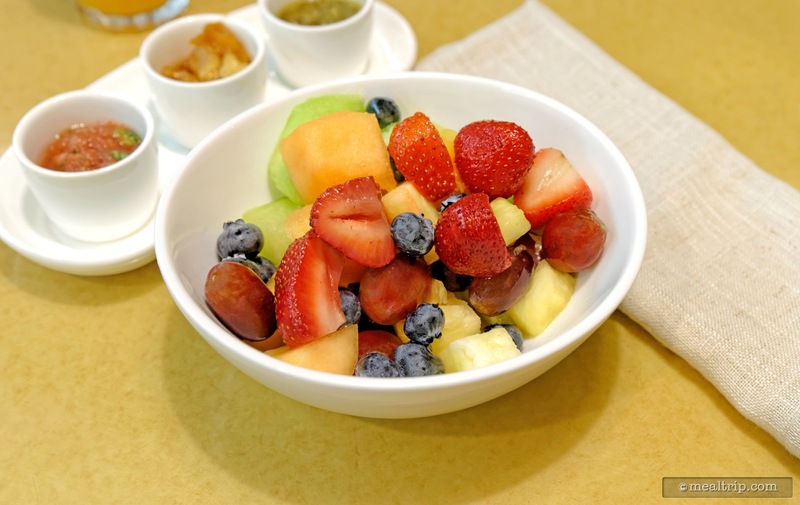 The first is a great looking bowl of fresh seasonal fruit, which has been cut into fork-able sized portions. There were two kinds of mellon, pineapple, blueberries, grapes and strawberries in my mix, which may change slightly depending on the time of year. Everything in this bowl was great and fresh. I actually kept this on the table throughout the meal, as it was always nice having an almost palate cleansing bite of fresh fruit to go back to. 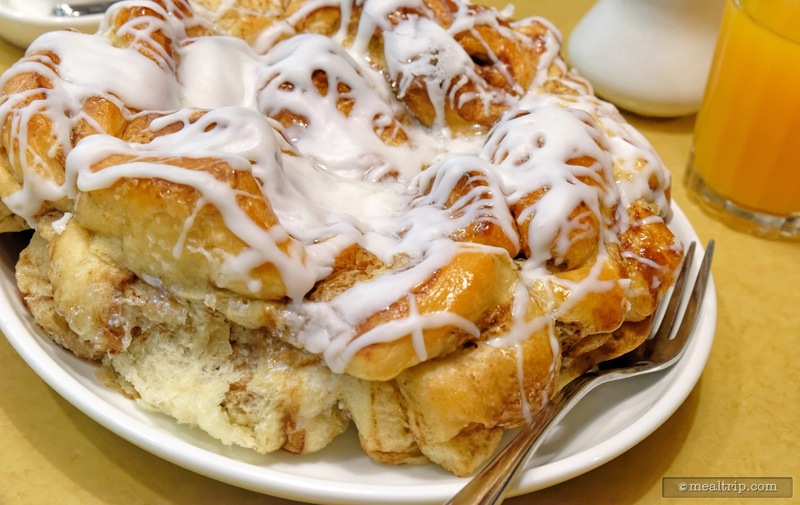 The other item in this first course is a giant "Chip's Sticky Bun Bake" which is basically a cinnamon sticky bun the size of your head, drizzled with warm vanilla icing. The cake portion of the sticky bun wasn't overly sweet (or overly cinnamony come to think about it), with the sweetness coming from the vanilla icing. It is a spectacle (especially when dining alone), and not something that one person could finish… at least not this one person. The skillet sticky bun and fruit made a great combo, and were a great way to start the breakfast. Next up, the second course or main "hot" portion of breakfast. But first, we have to talk about the three tiny condiment cups that have been placed on the table. These three tiny items represent the whole "greenhouse to table" message, as they… "Feature produce from the Land Greenhouse (below) and include a Salsa Fresca made with locally-sourced jalapeño-key lime hot sauce." Okay, let's break that down. Basically, they're going to try to make these three tiny condiments with raw ingredients that are grown downstairs in the Land Greenhouses… but when there's not enough raw stuff available to make any of them… at least the jalapeño-key lime hot sauce that's used in the red salsa, comes from somewhere less than 100 miles away. It's tough running a restaurant. I get it… I really do… but if this is going to be the one and only connection to the Land Greenhouses below, maybe it should feature something that is truly sustainable in the greenhouses… even if it is just a quick growing fresh basil or some other herb… maybe just the pepper in a mango chutney. Perhaps instead of the condiments, a few small cardamom teacup pancakes from a cardamom plant growing downstairs, or some cucumber bits in a panna cotta with basil… bam… there you go! I don't know… but I'm not sure anyone is really going to look at the green and red salsas or the apple chutney that are in these little cups and say "Oh yeah I totally know where this plant is in the ride". While I do realize that salsas are becoming very popular with scrambled eggs these days, only the red (in this case) really "paired" with the fluffy eggs. The (green) salsa verde just made me want some chips and a tequila, while the spiced apple chutney only really paired well with the ham steaks on the hot plate. But I digress... the hot plate "second course" is actually two hot plates! The first plate contains a few buttermilk biscuits and a well-spiced sausage gravy (the sausage is well-spiced, not the gravy). This is delivered on it's own plate because the white gravy would have a tendency to spread out under everything on the plate, given enough time. I find that the "country gravy and biscuits" item at most restaurants to be a bit on the heavy side, but the buttermilk biscuits here at Garden Grill were more like a medium density biscuit, and actually quite enjoyable (as if I needed more bread-based items after that sticky bun). The sausage gravy was very flavorful as well, but this is one of those dishes that you need to eat right away. Most white gravy has a half-life of 10 minutes, tops... then it starts to "set" as it were. The second plate contains everything else on the menu. A hearty helping of perfect looking scrambled eggs take center stage on the plate. It's nice being able to try the green Salsa Verde and red Salsa Fresca with the eggs... if you so choose. 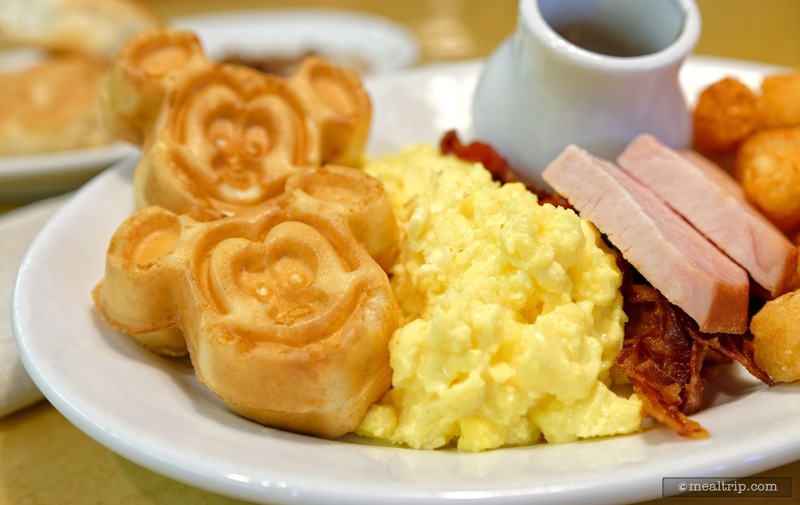 The eggs by themselves, are not much different that the scrambled eggs you will find at many Disney-wide breakfast locations. The main difference here is, that they are basically made-to-order. The family-style dining format basically insures that no one has picked over (or sneezed on) any of your food before it reaches you (it's up to the people sitting at your table to do that). The food here is all fresh and I don't believe large quantities are being prepared and kept warm for hours at a time. One of the things that's a little hard to see in our photos from the day, are several slices of equally perfect looking bacon. They manage to cook it to perfection without burning it to a charred mess by "baking" the bacon and not frying it! The process is a little like baking cookies in your oven... except, well... with bacon. An even heat (and possibly a bit of pressing) ensures that the bacon all gets cooked at the same surface temperature. Good stuff! Ham Steaks are listed on the menu, which is basically a thick cut ham, not unlike what you would see at a carving station, but more trimmed. The apple chutney condiment is supposed to pair with the ham steaks, but for me, the intense spices in the chutney overpowered the flavor of the ham. You'll have to decide for yourself on that one. 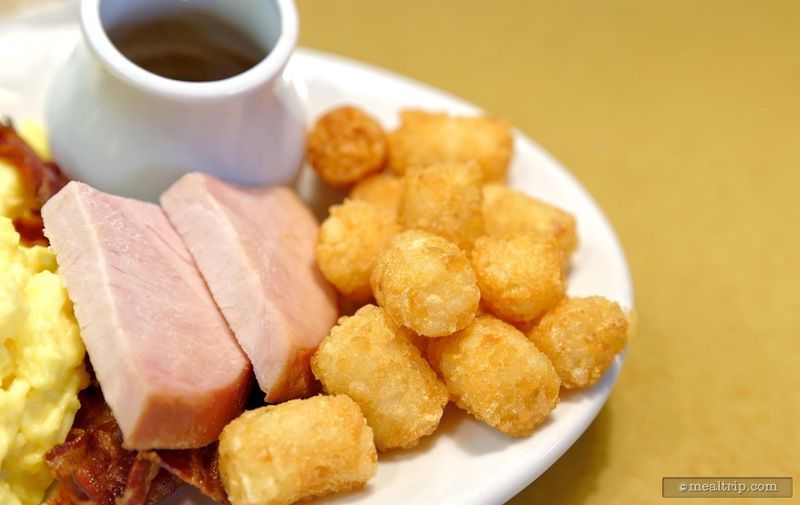 Hash Brown-style Potato Barrels are at one end of the plate. I am a child of the baby-boomer generation however, and so they will forever be known to me as Tater-Tots! These too were made to order and fresh enough so that the complex oils that they are deep fried in, had not started to seep into the item. While I did see a few dishes of ketchup being brought out by request (which is my favorite "dipping sauce" for Tater-Tots), the red salsa was not a bad substitute. There would have to be a whole lot more of the Salsa Fresca for me to really get into using it as a condiment for me Tater-Tots. 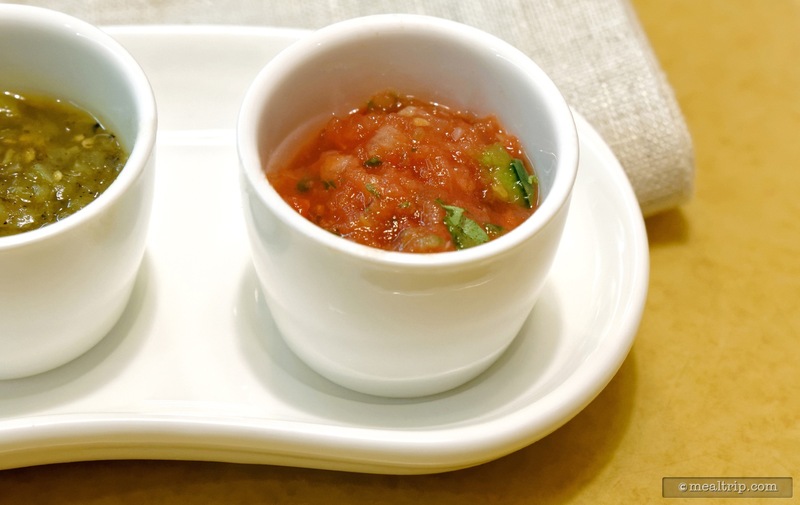 The tiny cups that the various salsas are delivered in are not much larger than the Tater-Tots themselves! Last but certainly not least, the Mickey-Shaped Waffles with Warm Chocolate-Hazelnut Sauce, were light and yummy as they usually are. The warm sauce is delivered table-side in a small decanter, and while I may let "chocolate" pass (mostly because is was that light brown color), "hazelnut" is a bit of a stretch. The warm sauce only had the most delicate hints of being chocolate (that's a nice way of saying it was very thin and watered down). But, it was nice having something other than syrup to pour over Mickey. In the past (for dinner) I've had hit and miss experiences at the Garden Grill. Today though, my server was right on top of everything, he knew the menu, he was able to answer any questions I had about the breakfast, and kept checking back with me to ensure I had everything I needed. You can't really ask for more. I was not, however, visited by a manager at any point during the meal. I know, you're saying "so what, they don't do that at my local restaurant". This is just my opinion of course, but because in-park restaurants are places that you may only visit once in your life, or once every couple of years when you are on vacation, it's important that someone "in charge", with honest to goodness guest services experience and training come over and say "Hi, my name is Bob. We wanted to thank you for having breakfast with us. How was your meal? Do you have any questions?" Preferably, while the meal is going on, so that if something is not right, they can make it right. If a manager would have visited my table, I would have told him that my server, Jeffery, was doing an amazing job and that the food was great. Unless management comes around and asks, how will they ever know what's working, and what's not? 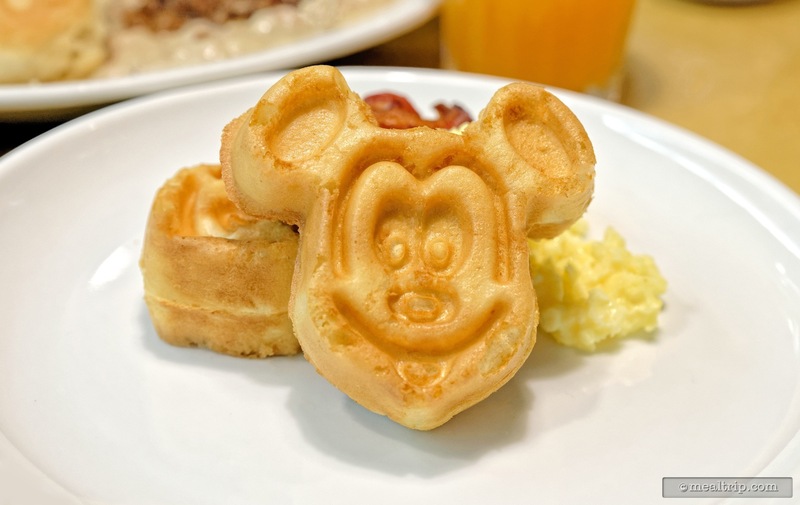 Most table-service breakfasts are turning into character meals all across Disney property these days, which does add to the expense of the meal. The $29.99 per adult price for the breakfast is likely to go up a bit during the holidays and then normalize (for a small time) between $29.99 and $32.99 (that would be my guess anyway). You definitely won't leave hungry because the made-to-order breakfast is served family style. You can get as many seconds or thirds of anything you want. The character interactions are a bit more quiet and personal because of the way the room is built. If you have been to a location like Tusker House or the Crystal Palace and thought is was a bit loud, there's a chance that it will be a little more subdued here at Garden Grill because you can only ever see 25% of the dining room at any given time. 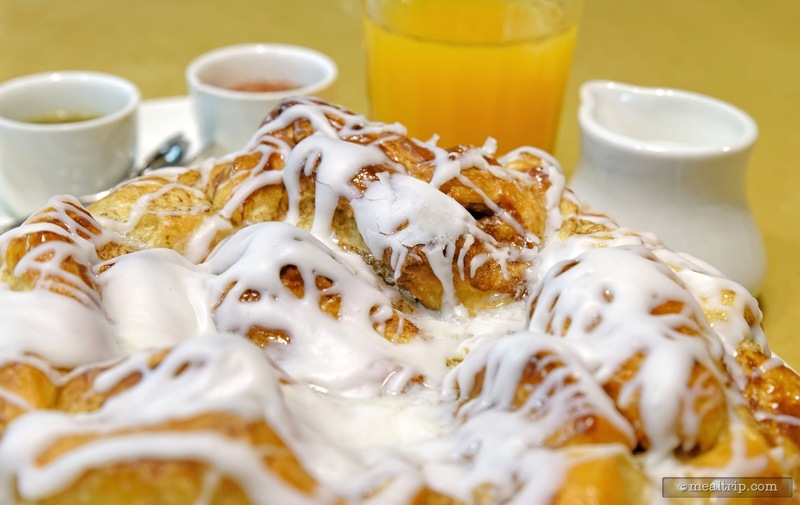 If you would like to increase your chances of having a quiet character meal even further, make reservations more toward the end of the breakfast period (anything past 9:45am). The characters will make their final rounds around 10:30am, but there's not really a big push to get you out of the restaurant until 11:15am or so. From 10:30am on, the location only seems about half full, and everyone is busy prepping for lunch which begins at 11:30am (no, you can't sit there and eat lunch too, sorry). All in all, I had a great time at the new Garden Grill Breakfast period. The food was great for an American-standard breakfast... just be aware that you are not going to find any complex culinary creations here. I do wish the greenhouse-to-table message was driven home a bit more, but a "family-style" breakfast means that most of the food, is going to have to be agreeable with most of the people at your table. 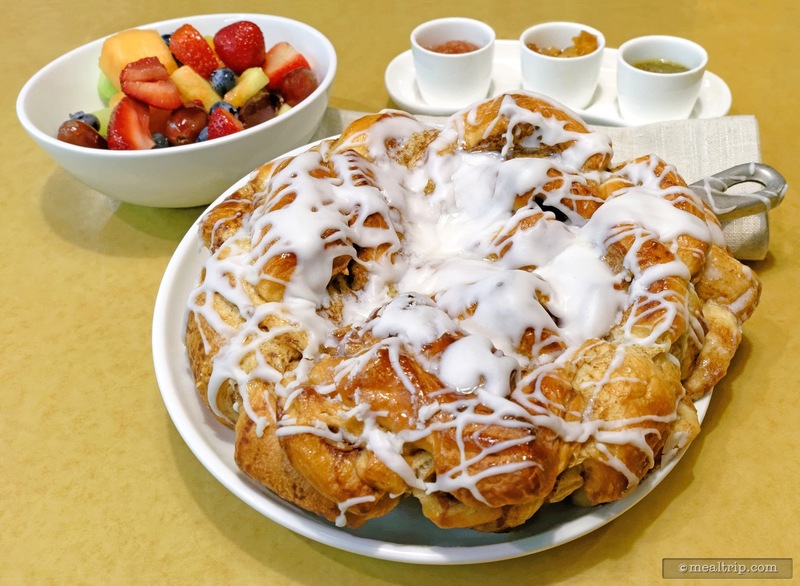 The fresh cut Seasonal Fruit and giant "Chip's Sticky Bun Bake" were memorable standouts for me, along with those perfect looking bacon strips! If you're looking for some character interaction and photo opportunities, in a slightly less chaotic setting than most Disney character meals, and want to have the option of eating a great big ("hey, let's skip lunch"), kind of breakfast, I would happily recommend the Garden Grill Breakfast! CLICK HERE to view all 21 images in our photo gallery.